Get The Latest SaaS Marketing Breakthroughs Right to Your Inbox. So you’ve invested your time, money, sweat, and tears into this business of yours. It helps people fulfill a need in their life and it’s starting to gain attention. In the beginning, you only had to worry about the software aspect to make sure that it was working properly. Now, you also have to worry about growth, getting your product out there, engaging with your prospective and current clients, and most importantly - monitoring the performance of your SaaS and identifying what works and what doesn't. Rather than just focusing so much on the startup process of your baby, you now need to divide your focus on the return and costs of providing your service, because people, lots of people, are starting to use it (a good problem to have!). It’s getting overwhelming and at this point you have a few metrics in place, but you’re not entirely sure how to utilize them to help you grow. 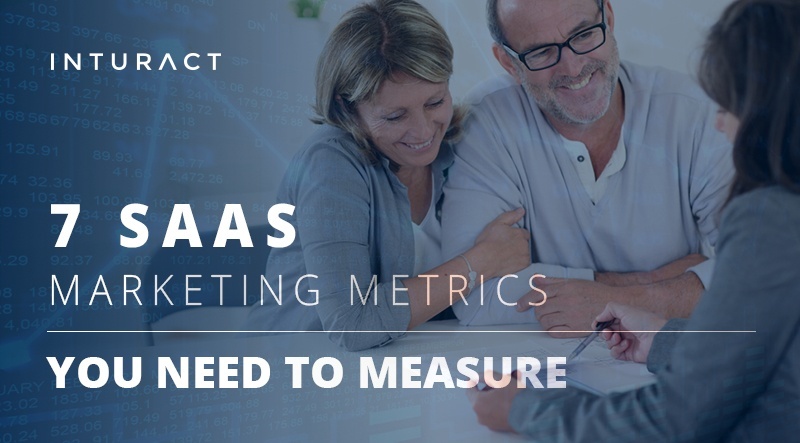 Here are some of Inturact’s must have SaaS marketing metrics to monitor your business, along with some ways to use your data to grow the hell out of your SaaS. It’s worth making it loud and clear that every SaaS company is different and contains their own unique SaaSHoles in their strategy. Big or small, we’re happy to get you on toward the road to recovery and help you tighten that SaaS! When you are focusing on inbound marketing, just as with traditional products and services, visitor-to-lead and lead-to-customer conversion rates are essential to monitor. If you don’t have traffic to your site, you are limiting the visibility of your product. Similarly, if you aren’t converting those visitors to leads and leads to customers, you won’t reach your maximum potential profit level. The percentage of leads you are converting to customers determines the makeup of your buyer's journey and proves you are product-market fit worthy. HubSpot suggests maintaining a 1%-3% visitor-to-lead conversion rate and striving for a 2%-10% lead-to-customer conversion rate. *Note: Your SaaS is unique and these are benchmark rates suggested to see if your business is on the right inbound track. What pain-point does your ideal customer have and how do you help them fix it? Why should they care about your product? How easy is your product to use? What incentives are available to make their experience with you the best possible? A churned customer is a person or business who was your customer and decided to part ways with you. It is a measurement of customer retention. Take the number of departed customers and divide it by total customers to find the churn rate. You want this rate to be as low as possible. A good rule of thumb most SaaS companies abide by is 5-7% annual churn – this is “the good churn rate” – which translates to 0.42-0.58% monthly churn. How do you work on getting your churn rate pretty? It will be a work in progress. Identify where people are turning away, and of those places, determine when customers are walking away versus sprinting as fast as they can. Here are a few tips to start brainstorming about customer success. Take advantage of the luxury of being able to literally track every click your prospective and current clients are taking. Look for patterns in their behavior. How often are they logging in? Where in your SaaS are they visiting most? Are they downloading all of your online resources? Do they lose interest after they see the pricing? Maybe they need a demo with their free trial. Maybe they need an incentive to continue such as a discount or a case study of how you’ve helped others. Or maybe they just forgot about something. Churn does not always mean cancelation and it is your job to set up automation or whatever it may be to keep them warm and cozy in their subscription. Set up automated emails to check in with customers no matter where they are in the funnel. Let them know that you have real people on standby to help them learn and use your product. Send them resources they’ll find useful. Even if your customer base is growing fast enough to break even or show signs of growth, focusing on lowering your churn rate will save you time and money, and grow your company faster. Alright, we have a strategy down to reduce churn, now let's focus on the revenue that is coming in monthly. One way to calculate monthly recurring revenue (MRR) is to multiply the total number of paying customers by the average amount all of those customers are paying you each month. When you have annual or quarterly billing, be sure to convert the amounts to monthly. For example, a quarterly plan of $300 would be $100 for the month that you are calculating the MRR for. MRR goes hand in hand with your churn rate. If your expansion MRR is greater than your churned MRR, churn becomes negative. This is a great goal to set for your business because it will lead to positive returns (it is a "negative" of a negative number, a double negative, which by definition makes a positive result). For MRR, focus on expansion MRR by selling upgrades. Consider more feature-rich plans, recurring add-ons, or additional users if you’re charging on a per-user basis. Other tactics to consider are reducing freemium subscriptions or charge for customer service. However, be mindful of the user and their experience when enforcing these strategies to avoid leaving them with an unpleasant taste. Customer acquisition cost (CAC) measures the total cost of your combined marketing, sales, and business costs to acquire a customer. Divide the total costs associated with acquisition by total new customers, within a specific time period. Your CAC tells you how much ROI you’re getting from your marketing and sales efforts. When tracked correctly, you can also tap into identifying what marketing channels are working for you and which ones are not worth the costs. Use your CAC to find where your best customers are coming from. You want to be able to make up your CAC in less than 12 months. But less than 7 months is ideal. Make sure to include any and all costs that it took to acquire customers. Failing to do so will leave you with an optimistic number which can set your business up for failure. Lifetime value is a measure of the overall value that a customer adds to your business over the course of their relationship with you. Lifetime value is tricky when it comes to SaaS businesses because the prediction of how long a customer will stay with you is just that, a prediction. This may take some time to configure an average lifetime but once you have a timeframe that illustrates your average customer, you can determine how much repeat business to expect, which will then help you decide how much your CAC can be. Lifetime value is important when comparing costs of a subscription customer because you don’t want to compare the costs solely to a month or year’s worth of customer value. It is most accurate to compare costs to the overall value that customer will add to your business. This brings us to our next metric. Once you have the two previous metrics in place, you can contrast their ratio for deeper insights. The LTV to CAC ratio will help you determine how healthy your company is in regards to the time it takes to recover the time and money spent on acquiring customers. Having an LTV to CAC ratio of at least 3. 7 and up is superb. Some say having a ratio above 4 indicates that you might be under-investing and could actually be growing faster. Last but not least, what is your NPS score? Your Net Promoter Score (NPS) is a disciplined number that you configure based on what your clients think about your product. This score will help you understand how likely your customers are to recommend your product and promote it to their peers. To find your net promoter score, find the percentage of your promoters and from that subtract the percentage of detractors (haters). Your NPS can range from a low of -100 (If every answer is considered a detractor) to a high of 100 (if every customer’s answer is in the Promoter range). Different businesses have their own set of scores they hold themselves accountable to. Some suggest a great goal to aim for is a score of 50 or higher. Feel free to reach out to us with any questions in this process. As a matter of fact, we’d be glad to set up a quick call for a free SaaSHole assessment. We can dig deeper into these metrics and find opportunities in your marketing strategy that are waiting to be unconvered! Our SaaS experts will look at your current SaaS inbound marketing strategy and identify possible solutions to talk through with you. Click below to set up a quick, free SaaS marketing assessment.